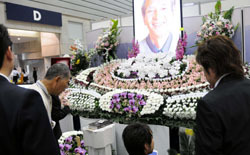 Funerals in Japan incorporate a unique mixture of religion, tradition, culture, ritual and geography that to the outsider may appear perplexing. Do funerals generally have a religious context? With regard to rituals, most Japanese partake in a mixture of Shinto and Buddhism, with the latter customarily focused on funerals and the departed. According to a Tokyo Metropolitan Government survey in fiscal 2001, 85 percent of 453 respondents said funerals they have participated in were Buddhist in nature, 4 percent were Shinto and 3 percent Christian. A further 4 percent said they have been involved in nonreligious funeral ceremonies. How does a typical Buddhist funeral ceremony proceed? The immediate family first keeps a night vigil, or wake, over the deceased on the day of death and generally holds the funeral the following day. Participants can attend either the wake or the funeral, or both. During the wake and funeral services, participants who are not among the next of kin customarily offer money to the bereaved and burn incense to pray for the soul of the deceased at a temple or other venue where a monk chants sutras before an altar. After the ceremony, the deceased is often carried in an ornate hearse to a crematorium. After the cremation, the family and close friends use special chopsticks to collect bone fragments for a cinerary urn, which is traditionally placed in a family grave within 49 days after the funeral. Rituals can vary, depending on the branch of Buddhism dealing with the deceased. In recent years, ceremonies have generally tended to become simpler. Why are rites performed at both the night wake and the funeral the following day? The wake is the last occasion for the next of kin to spend time with the deceased, and the funeral is a ceremony of departure. Wakes are believed to have originally been gatherings of pupils who talk all night about the lessons from the Buddha when he passed away. These days, relatives and friends stay all night in a lighted room with the deceased, at least as per the practice of the Jodo sect of Buddhism, according to its Web site. Wakes are also nowadays more convenient for working people to attend than funerals. Why do participants offer money to the next of kin, and what is the general amount? It is customary for people to make a monetary offering to those holding ceremonies, including funerals, to ease the financial burden of such events. The amount paid often depends on how close the contributor was to the deceased and how old the person is. When a colleague dies, the amount can range from ¥3,000 to ¥20,000. When parents and siblings die, family members may pay more. Part of the custom also entails a return thank-you gift for the offering, in many cases a designer towel or dish. What is the proper attire for attending a funeral and proper way to burn incense? Basic black suits, dresses, ties and shoes are the norm, and accessories are kept to a minimum. Wearing gray clothing at a wake is acceptable because it is considered a gesture that the attendant felt the death was unexpected. At many ceremonies, a tray is passed around with incense powder and a flame. The usual practice is for attendants to hold up a small amount of incense and then put it in the flame bowl, repeating the drill one or two more times, depending on the Buddhist sect. The next of kin and close friends traditionally hold memorial services on each seventh anniversary of the death up until the 49th, although not everyone strictly adheres to this. Similar services are even held one year, two years and six years after a death. At a gathering at the home of the deceased or a close relative, a monk will chant sutras in front of the family Buddhist altar and then dinner follows. Cleaning family grave plots on the anniversary of the death or during the weeks of the vernal and autumnal equinoxes are common, as well as during the Bon holiday in August, when people who do not live near their family graves have time off work to make the trip. Why is cremation the norm here? Cremation in Japan springs from Buddhist tradition. The practice is based on the legend that the Buddha’s body was burned and his soul transmigrated, unlike the belief of Christians, Jews and Muslims in the Resurrection. The first recorded cremation in Japan was in 700 and coincided with the arrival of Buddhism in the sixth century. But in the early years, only monks and high-ranking people were cremated because the wood to make the fires was too costly, according to the book “Sekai no Soso” (“World Funerals”), compiled by monk Kodo Matsunami. The custom spread nationwide only after the war, because of the limited land in urban areas and for sanitary reasons. Before and during the war, burials were the norm. By fiscal 2007, cremation accounted for 99.8 percent of all those who died, according to the health ministry. Big metropolitan areas, particularly Tokyo and Osaka, have local ordinances that require cremation for the sake of public health and because there is not enough land to allow burials. Rural, remote areas aren’t always so restrictive. Do Japanese Christians seek to bury their dead like many of their Western counterparts, who believe the body is needed for resurrection to occur? Cremation is the norm for Japanese Christians. Although Muslims here are few in number, they have a cemetery that accepts burials in Yamanashi Prefecture run by the Japan Muslim Association. How much do funerals and related services cost? The costs average ¥2.31 million, including ¥1.42 million for funeral-related fees and ¥401,000 for catering to attendants and ¥549,000 for monks, according to a survey published by Japan Consumers’ Association in 2008. But the costs depend on the size of the ceremony. Two out of the 314 respondents of the survey said they spent ¥200,000 to ¥300,000, the lowest amount, which another two shelled out more than ¥10 million, the highest. No, and the trend is to spend less. “In recent years, we see the trend because many people become more practical and do not spend wastefully,” Kamakura Shinsho, which publishes funeral-related dictionaries, says on its Web site. 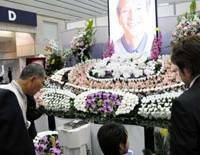 An increasing number of funerals are held only by the next of kin. Some go for unconventional funerals and forgo the typical, and pricey, Buddhist trappings. Some gatherings will play the favorite music of the deceased. Others may show photographs of the dead. Even the family plot may no longer be the final resting place. Some people want their ashes scattered at sea or from an airplane. Other Japanese have opted for much pricier excursions, having their remains sent into space, Kamakura Shinsho notes.